288. Ekambi and A Fake Money Printing Machine. 1n 1937 in the month of September two men visited Ekambi at his residence in Tiko and showed him a machine that they said prints in one hour twenty five genuine brand new British pound notes. The men said they were fishermen from an island called Kita in the Gold Coast and that they acquired their machine from a British sailor. They proposed that Ekambi should buy the machine for 200 pounds. A tiny British Flag and a small printed label “Made in England” were glued on the machine. 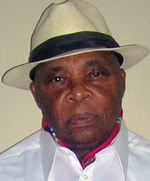 Ekambi was a successful business man in Tiko. He owned an impressive residence and two big canoes for commercial fishing in the creeks. 290. The Traditional Format of addressing a Married Woman. Liyengu la Mokoso, e-molana amba Eliva Lyonga, that is Liyengu la Mokoso, the wife of Eliva Lyonga.. In her matrimonial home, she is addressed “Nyanga Ndavo,” that is, the Mistress/”Madam” of the house/home. Her husband is addressed “Sanga Ndavo”, that is, the Master of the house/home. The Bakweri have no word for Mrs.
281. Elova-lova asa tingeve mooli. (sunset cannot be stopped). Many, many years ago, by coincidence, a delegation of farmers from Wojuwa villages and a delegation of fishermen from the villages of Mesellele, Modeka, Ewonji and Tiko, situated on banks of creeks met at the sorcery of the renowned Geographer Mosongo Inoni. The two delegations had similar complains. The farmers said that the rainy season had started too soon, much earlier than is expected and that it was difficult for them in the circumstances to complete felling down of trees and shrubs, burning down of bushes and planting of crops before the commencement of severe rain fall. The farmers requested Sorcerer Mosongo to mystically extend the periods of sun light so that they would continue to work in their farms until close to midnight.